Want to know when prices drop at shopping sites? When someone posts a new message on a forum? When your favorite website posts new content that is not offered via its RSS feed? All of these usage scenarios and many more cry for programs that can monitor website changes. What should a program that monitors website updates come with? It should obviously check the website in intervals and compare the active state with a previous state of the website. The website updates should then be announced to the computer user if changes are noticed. Optional nice to have features for website monitoring systems are changes that are highlighted on websites, options to ignore minor website changes (e.g. date and time that are changing every minute) or logging functionality. The following list highlights five tools for monitoring websites. Three of the tools are Firefox add-ons, one is a online service and the last a software program for the Windows operating system. We encourage readers to add additional tools (should be a free website monitor software, service or add-on) in the comments. 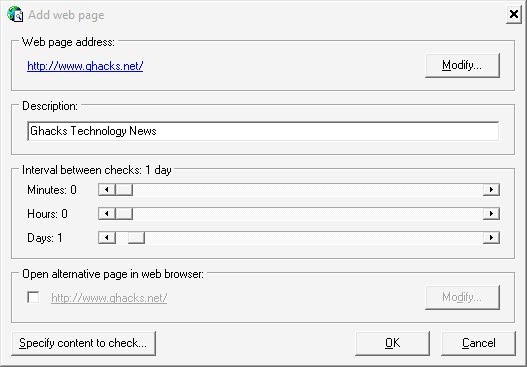 Check 4 Change is a Firefox add-on. It is probably the most basic tool to monitor websites that is reviewed in this article. 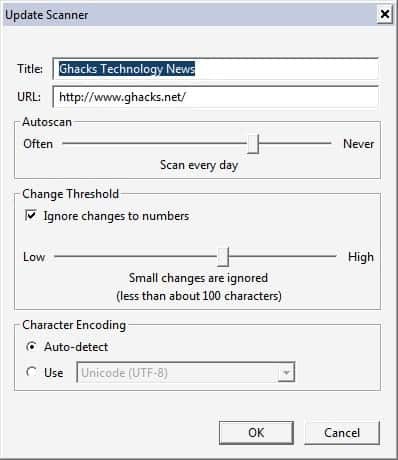 You can select text on a website, right-click to display the context menu and select the Check 4 Change option from it to set one of the available intervals for the monitoring. Website Updates are displayed in the tab of the website that is being monitored. This outlines one of the biggest weaknesses of this add-on. The website has to be open to be monitored by the Firefox add-on. A few options are provided by the add-on. It is possible to change the interval and configure several notification options that include playing sounds, popups or bringing the window to the front. The add-on is best used for monitoring websites that require authentication. It could for example be interesting for monitoring web email accounts. Update Scanner uses a different approach than Check 4 Change. The program monitors the complete website for changes automatically with options to ignore number and minor changes. Another benefit of using this website monitor is that the websites that are monitored do not have to be open for it to perform the update checks. The interval of the checks for website changes is set to once a day by default. This value can be changed to a minimum of every 5 minutes or set to manual scan on the other end of the scale. The add-on places an icon in a Firefox toolbar upon installation. A left-click on that icon opens a sidebar that displays all websites that are monitored by the add-on. This sidebar contains buttons to perform a manual scan, open one of the monitored websites and to access the preferences of the add-on that allows you to configure notification settings. Available for selection are sound and popup notifications. Site Delta is the third (and final) Firefox add-on for monitoring websites. The add-on may seem confusing after installation as there is no apparent way to add websites that you want monitored by it. Update: The original SiteDelta extension is not compatible with Firefox 57+. The author has released two new monitoring extensions that are. The add-on begins to monitor websites for changes if you click its icon in the Firefox toolbar. The active url is then added to the list of pages that are monitored by the add-on. The icon glows green if the active website is monitored by it. A right-click opens a context menu that you can to configure the monitoring in detail. 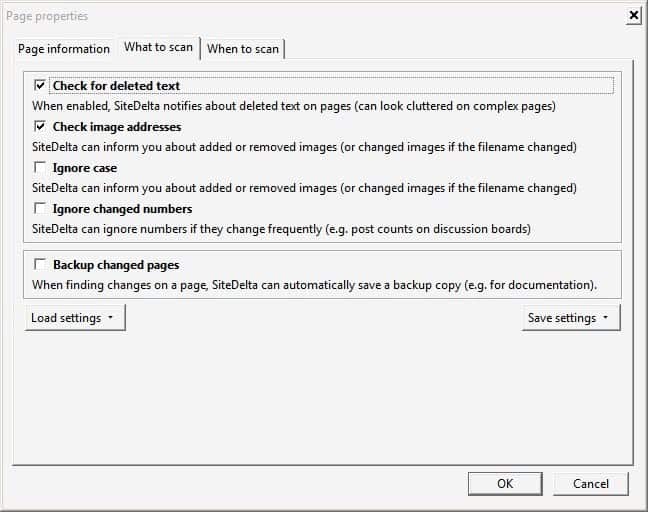 You can configure the scan options in two tabs. The add-on by default checks for text and image changes. It is furthermore possible to ignore case or numbers and to create a backup copy of the page whenever changes are recognized. 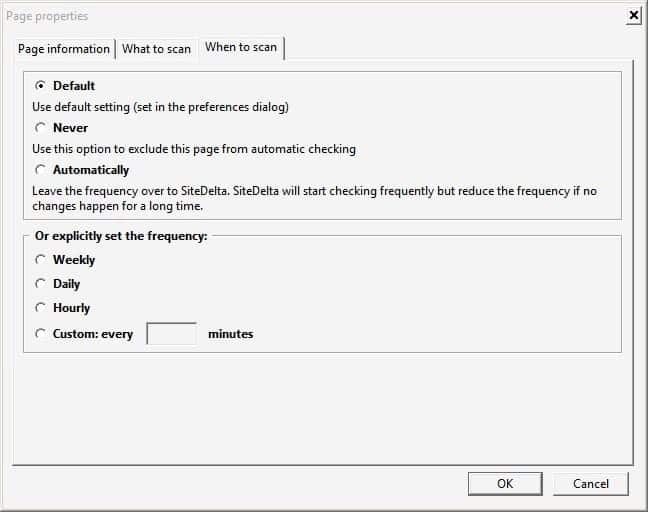 The when to scan tab can be used to configure the intervals of scans. It is possible to set a specific frequency or let the add-on handle it. It seems to use an algorithm that reduces the checks if the website that is monitored is not updated frequently. Change Detection is a free online service that can monitor websites for changes. An account is required before websites can be monitored by the service. The website url and an email address are provided in the first step of the process. The service will then try to scan the website. 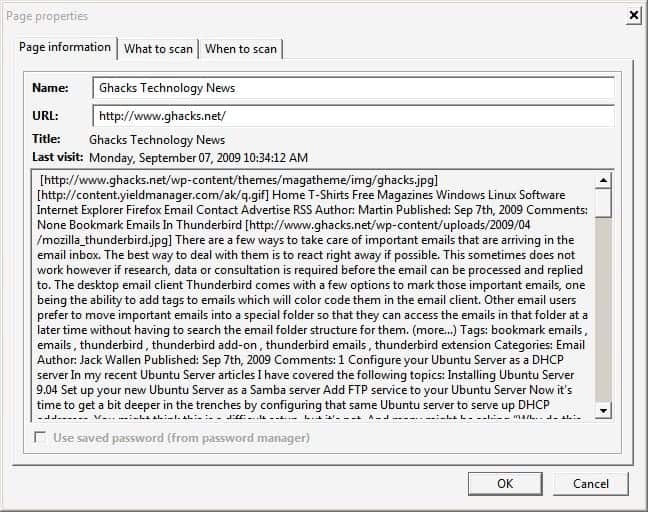 If the scan is successful step 2 is displayed. The notifications and type of changes to trigger notifications can be configured in the second step. Notifications can either be provided by sending emails to an email account or by offering an RSS feed that is being updated with website changes. It is possible to configure the online monitoring service to only send out notifications if sizable changes have happened on the monitored websites. It is furthermore possible to define text that should trigger notifications (either if it is added or removed from the page which could be interesting for link building purposes). WebMon is the only software program included in this review that is capable of monitoring websites. The website monitoring software has a few advantages over Firefox add-ons. It can be run in the background even if all web browser windows are closed. The Firefox add-ons can only perform checks for updated websites if the web browser is running. The program comes with an easy to use interface. It always starts by adding an url to the program. Any url that is currently in the Windows clipboard will automatically be pasted into the form right away. It is then possible to configure the intervals of the checks using minutes, hours and days slider in the interface. The process is complete if you want all contents on the page to be monitored. Users who want to specify certain text or elements on a website can do so by clicking on the "specify content for check" button in the configuration window. It basically allows you to specify the range of content on a website that should be included in the checks. 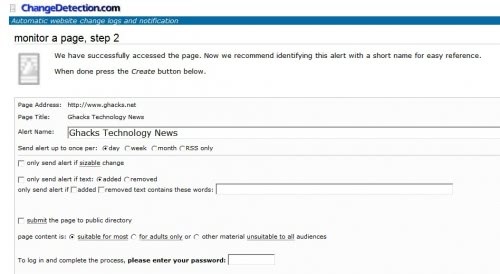 The website monitoring software notifies you with popup alerts or sounds. It can furthermore run a command if an update is found. Many additional options are provided that include proxy server support, logging or to import and export the list of monitored websites. Page Monitor is a Chrome extension that enables you to monitor web pages for changes, and get notified when changes are noticed. Web Alert is a handy application for Android that provides you with the means to monitor websites for changes. Server Monitor is another Chrome extension that you may use for the purpose. Website Cop is a Windows program to monitor and repair web pages. The right website monitoring software, add-on or service depends highly on what you require it for. Users who work with their web browser all the time may prefer the add-on solution to monitor website changes. The online service on the other hand will monitor websites remotely so that your computer does not need to be on at all to monitor changes. The website monitoring software on the other hand is the most flexible tool that provides options to execute commands if changes have been detected. The guide looks at five tools, three Firefox add-ons, one Internet service and one desktop program for Windows, that you can use to monitor content on web pages. Another add-on that monitors web changes is Alertbox, which is currently an experimental add-on. It’s a bit bare-bones, but it works nicely for me. SiteDelta seems to be the most advanced of the 3 Firefox Add-ons, but it constantly gives me false positives, so I can’t use it at all. 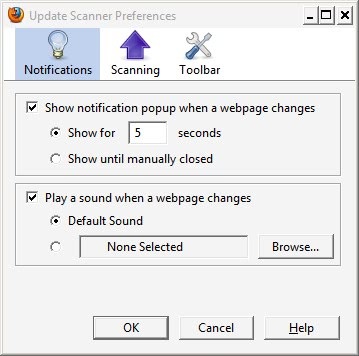 I use a mix of UpdateScanner and Alertbox instead, depending on the way the website I want to monitor is set up. Will try out Webmon. Thanks for the heads-up! The free online service for monitoring webpages that I use for years now is http://www.whatchthatpage.com. I have been using this service for years now, and they suit my needs 100%. Thanks martin, i test website for a living and this little guide will no doubt be helpful in the future. Using Webmon for more than 5 years. Tried a few other Webmon-style programs – but none was so functional. I’m still undecided about AlertBox. I do like that I can view all updates at once and in one page and decide on whether or not to load the links in tabs as opposed to kind of being nagged to death by Update Scanner. But for now Update Scanner is probably my most frequently used add-on and I like it overall. Nice post. This will be very helpful since I want to run a business soon :D….thanks for the tips. +1 For watchthatpage. Run by nice guys to. Do any of these tools accommodate or do you know any? Joe the problem is the sign in. What you could try is to add the username and password in front of the url that you want to monitor, e.g. http://username:password@www.ghacks.net/ I do not think that any software can check dynamic pages though. Results are available as email, rss and sms. Webmon hasn’t been updated for a long time. Anything that’s kept up-to-date with similar functionality (and also freeware)? If anyone is would like a free 8 week trial please email me at and I’d be delighted to get you set up. Now opera has a new addon to monitor websites. As it is a mobile solution, you are informed wherever you are, and you can get updates every minute if you want. Is there any checker for google chrome like check4changes on firefox? Perhaps you check out wobserver.com – it has a Chrome Extension for its online service. WOW am I surprised NOBODY has even mentioned website-watcher.com. This is by far the crème de la crème, I’ve had over 600 websites added (don’t ask) all on various timers and without a hitch ever. You can make plugins within the program to do custom updates and when I say its extremely configurable, its a huge understatement. Its well worth its price, try the trial, you seriously can’t go wrong with this. I would like to see one of these with some context sensitivity. For example, and a big example, take Google search. I’ve used Update Scanner in FF but it notifies me whenever enough of the little details on the page that have nothing to do with the search results change. I want a feature that can parse the page and notify me only when the search results change with some control over what in the search result is considered relevant. It should also use the same “Search Tools” settings as what I use when I ask for it to be monitored. Try wobserver.com. There you can select an area on the web page you want to monitor. please have a look at: http://wobserver.com/features “Area Detection”. Thanks, Jan. That looks sweet. Subscribed and added a Google search page of interest that gets many trivial changes, defined the first line of the search results as the area to be monitored and now we shall see. Wachete has mobile applications for Android, WP and iOS and as well 1 click plugin to chrome. They understand content so if it is number they make even graphs. You can setup also complex notifications. Recently they added crawling and watching of whole web with subpages. Do you (or anybody else) know of a similar desktop application or an addon for Internet Explorer that is similar to Check4Change for FF? Yeah the website appears down. I have uploaded the latest working version of WebMon to the server. I’m not aware of something for IE though. still using it, but trying others. +Jack – Thanks and me, too. I’ll post back if I find something interesting. Never get enough of this site.!!! Just found this one, up for grabs anyone …. NotiPage is a FREE webpages monitoring software. Once you’ve configured a monitoring alert related to a specific webpage, NotiPage will automatically check this webpage on a periodic basis until all the set criteria are met. At that time, NotiPage will warn you by a visual and audible alert. Thanks again, Jack, but this one gives me pause. Although I don’t know enough to be afraid of .NET, NotiPage has concerning Privacy and Logging policies. They are upfront and clear about it, at least. See here: http://www.notipage.com/en/license.php . WebMon is silent about whether it monitors our website visits and keeps logs of them for use outside our machines. I sent its author a note and will share whatever he says, if he says. COLIN MARKWELL, WebMon author, quickly and graciously provided answers to my questions. “In summary, “no” to everything. select properties, you can see the checksum. it doesn’t do anything else with them (e.g. sending them anywhere). others, not as a money-making initiative. Sad news: Update Scanner doesn’t work with the latest Firefox (43.0). Unless, of course, developer Sneaky Pete gets around to solving that problem. Even if he doesn’t, I’ll be grateful to him for a very long time. You can also use https://sken.io . It works best for me. Is there any site similar to http://www.changemon.com that doesn’t cost money? They made it into a paid service after it being a free service for a year or more. There was also trackly.io but its also going to be a paid service next month.